Sometimes it takes a little imagination. Sometimes it takes a little inspiration. And sometimes it takes a tourist on holiday. 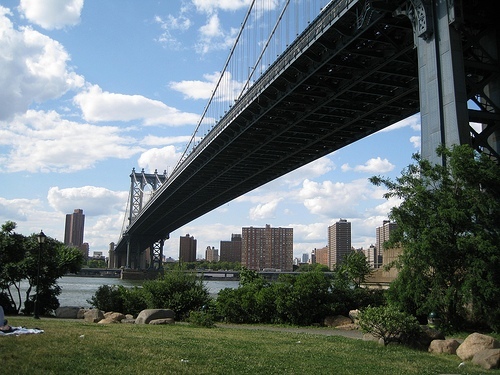 This morning all three came together when I saw Pamela Hutchinson’s photo of the Manhattan Bridge on Brownstoner. This is exactly the view that we should be seeing from South 6th Street and Kent Avenue. Instead, we see a parking lot on City-owned property being used for all sorts of things, none of which have any need to be on the waterfront. The City Council is taking up the Domino rezoning on Monday. 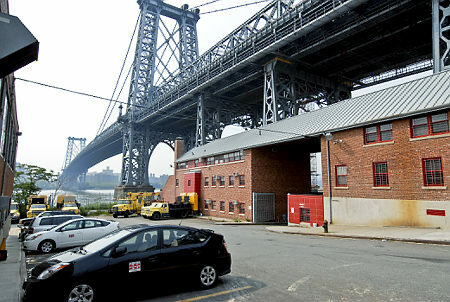 Call your Councilmember and tell them to turn the DCAS property under the bridge into Williamsburg Bridge Park. Tell them that Domino will reduce your access to open space. Tell them that the community demands a better Domino. This has been in the dialogue for so long but we still have junk and a useless old building there! Could we have a dog park incorporated into this? We have lots of dogs on the Southside, but the closest park for them is McCarren. Yes, a park would be amazing considering all the new developments along Kent Ave! Along with those developments are dog owners as well and the nearest dog park is at McCarren.